Your whole body is dependent on having a healthy spine, and chiropractic care is there to look after it. The spine is the flexible column of vertebrae that supports the body and encases the nerves of the spinal cord that carry messages between the brain and the body. Those nerves control all your voluntary movements, as well as automatic functions such as circulation and digestion. If vertebral joints malfunction or become ‘locked’ from poor posture, trauma, or built up physical (and mental!) stress, then your flexibility will suffer. The loss of flexibility means that your muscles will likely have to overwork to keep you moving, leading to muscle tightness and soreness. Additionally, vertebral joints that are malfunctioning can cause pressure or irritation of the adjacent spinal nerves, leading to muscle spasms and pain. Chiropractors specialise in detecting and correcting these joint malfunctions, with gentle positioning and hand-delivered or machine-assisted adjustments. 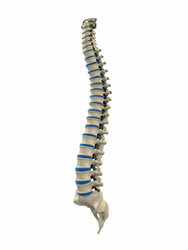 Chiropractors are also trained to thoroughly assess for spinal misalignments. At worst mechanical joint dysfunctions can lead to excessive or wrongly angled curvatures into the spine. This is known as scoliosis, which may place further stress onto your vertebral bodies and affect your posture. Treatment with adjustments may slowly fix these misalignments – it is a step by step process. Our chiropractors in Joondalup- Perth are also trained in extremity work. We are trained to unlock joint misalignments or joint dysfuctions of hip , knees, elbows, wrists, ankles, feet and toes. Click here to learn more about Chiropractic Terminology. Chiropractic is the holistic approach to a healthier body. If you want to take the first step to a healthier you then call us on 9300 0095 or book online at www.lakesidechiro.com.au in with us today.